Providing much-needed information on fluorescence spectroscopy and microscopy, this ready reference covers detection techniques, data registration, and the use of spectroscopic tools, as well as new techniques for improving the resolution of optical microscopy below the resolution gap. 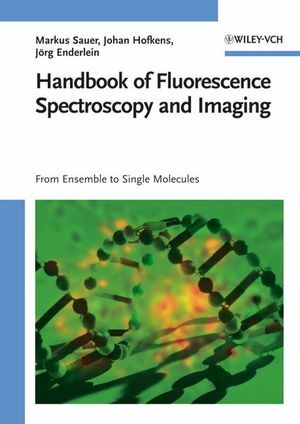 Starting with the basic principles, the book goes on to treat fluorophores and labeling, single-molecule fluorescence spectroscopy and enzymatics, as well as excited state energy transfer, and super-resolution fluorescence imaging. Examples show how each technique can help in obtaining detailed and refined information from individual molecular systems. Markus Sauer studied chemistry in Karlsruhe, Saarbrücken, and Heidelberg, and finished his PhD in Physical Chemistry at the University of Heidelberg under the guidance of Prof. Jürgen Wolfrum. After a short-term visit at LBNL, Berkeley in the group of Prof. Shimon Weiss, he was decorated with the BioFuture award to perform independent research on single-molecule handling, detection, and identification. He finished his habilitation in Heidelberg at the Institute of Physical Chemistry and is now Professor for Applied Laser Physics and Laser Spectroscopy at the University in Bielefeld. Johan Hofkens received his MSc. (1988) and Ph.D. degree (1993) in Chemistry from the University of Leuven (K.U.Leuven). After postdoctoral research with Prof. Masuhara at Osaka University and Prof. Barbara at the University of Minneapolis, he rejoined the K.U.Leuven supervising the Single Molecule Unit in the group of Prof. De Schryver. In 2005 he was appointed Research Professor at the K.U.Leuven and recently he was promoted to full professor. His research interests are fast spectroscopy, (single molecule) fluorescence microscopy and nanoscopy and the application of these techniques in material science and biosciences.